In the past few posts of Going Pro, we've looked a lot at copyright. Again, a lot of people have opinions, but it's important to see what the legal definitions -and what steps you can take to protect your creations- really entail. Today though, I want to propose a question. Suppose you post a nifty image of a prehistoric critter online. It's awesome, you're proud, people give you kudos. You put it under a Creative Commons Licence, the most restrictive one that says your image a) must be attributed to you, b) cannot be altered, c) others cannot profit from it, and otherwise, it's okay to post and share. 1. Then someone copies it. Another blogger. Does their own riff. Are you okay with that? 2. What if they're more famous than you, getting lots of illustration gigs, but they notice it, do their own version, and give you a nod for your cool idea. Still excited, feeling the attention? 3. What if your painting happens to hit the zeitgeist and goes all viral all over the interwebs. Everyone is sharing it. There's a day on Facebook where all the users switch to you image. But you haven't made a dime. What do you do? We're in interesting territory. Personally, I don't believe overly restricting images (insanely huge watermarks, disabling right-clicking) are helpful to make a successful career anymore. But neither is completely open sharing. It makes a strong case about question number 3, doesn't it? But how do you capitalize on that image going viral? How does it put food on the table? I suggest it's how you parlay that viral dinosaur image into getting new contracts. As for questions number 1 and 2, consider the post-modern, remixed, mash-up, variant-cover culture we live in. Think an Indiana Jones video game is fun? What about Indiana Jones Lego! Like Batman? Sharks? Lightsabers? Ta-da! 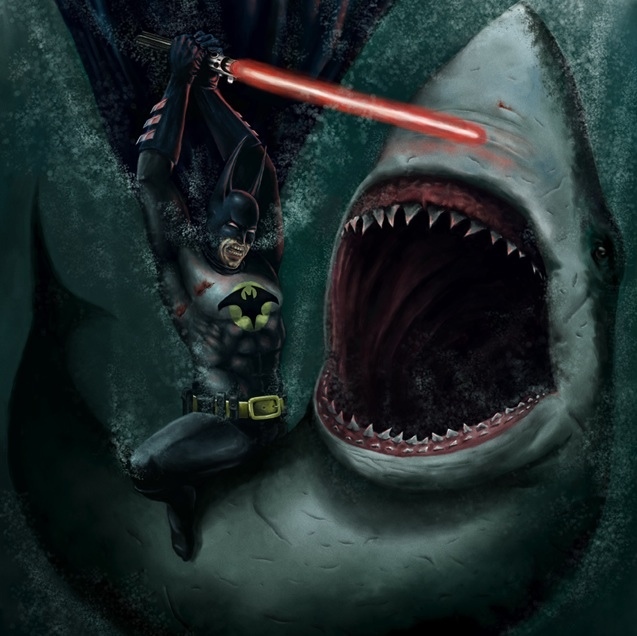 (artist here) Authoring mash-ups and riffing on others' work is an integral part of pop culture. Painting gets started at about the 4 minute mark in the video above. In the past, I've sometimes been the dissenting voice here at Art Evolved about all those posts showing past-art about upcoming themed galleries. I dislike them because sometimes attribution to the artwork cannot be easily found - though yes, as Peter and Craig have pointed out to me, sometimes we attribute an "orphan image" after the post goes up when a reader identifies it. I'm uncomfortable with those posts because in a world of remixes and fun Photoshopped images, attribution and authorship can sometimes be your only coins to bank on. Literally. Everyone has different comfort zones. Where do you feel comfortable with your images on questions 1-3 above? 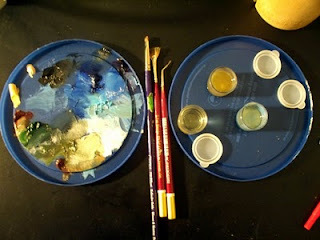 Written by Glendon Mellow On March 29, 2012 In "Art Evolved", "Going Pro", "Symbiartic", "copyright", "meme", "scientific illustration"
After posting recently about Pinterest, I've been involved in a lot of discussion about their Terms of Service. Here's a quick link primer to some of the discussions I'm involved in and I'm seeing in the science-art blogosphere. Pinterest does a lot of things right: links back to creator's sites, deleted pins get deleted on all subsequent re-pins - these are good things. Pinterest has some problems: most people pin whatever neato things they find online when the Terms specifically state you must own the image or have permission. So it's built on misuse in many ways. Personally I think more artists should use Creative Commons type attitudes toward this type of sharing. But the point stands that most users violate Pinterest's own Terms of Service. Pinterest has some Peril: they can "sell" and "otherwise exploit" all content according to their Terms of Service. So if you use it correctly, you're giving away your work which then involves risk assessment. Read through these links to get the whole picture so far. Pinterest's Terms of Service, Word by Terrifying Word _Symbiartic by my co-blogger, Kalliopi Monoyios. ART Evolved is a No-Pin Zone, sadly... -ART Evolved by administrator Craig Dylke. I'm affiliated with ART Evolved but I wasn't involved in this decision beforehand, for the record. Good move though. *****Edit: It was announced on March 23rd 2012 that Pinterest is indeed dropping the "sell" term in their Terms of Service - as well as making many other changes. Storify below takes place as of time of the original post. For those not on Twitter, after the jump I've included a first attempt at a Storify of some of the comments there. There's a lot of retweets of some of these, so a lot of people are listening who haven't weighed in. 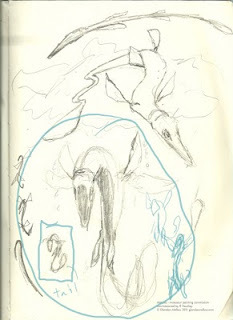 Written by Glendon Mellow On March 20, 2012 In "Art Evolved", "Pinterest", "Symbiartic", "article", "blog art", "copyright", "links", "science art"
Had some fun with textures and feathers on this Avimimus sketch earlier in the summer. Thought I'd post it now, since there's an interesting discussion started by Craig Dylke over at ART Evolved about dinosaur feathers and accuracy in science art and film. New! Find me on Symbiartic, the art+science blog on the new Scientific American Blog Network! Written by Glendon Mellow On August 22, 2011 In "Art Evolved", "avimimus", "dinosaur", "pencil", "sketch"
Going Pro: free dinosaur art? The ART Evolved blog I loosely administrate for (the heavy work being done by Craig Dylke, Peter Bond and Mo Hassan) has been doing extremely well the past year, with more and more talented people contributing not just to the themed galleries, but also to some fascinating posts. It's what we wanted for the site: artists and researchers and dino fans enjoying the art and thoughts about creating it. Spin off blog posts (like this one) are becoming more common as people choose long-form comments on their own site about happenings at the ART Evolved hub. Recently, a student researcher approached ART Evolved with ideas for a contest for artwork through the site's loose network of members and contributors, the prize being that the unpaid work would appear in a presentation in front of some paleontology luminaries. Already our decision to post something about the contest for contributors has met some justified criticism. I commented the following on ART Evolved, but thought I would post it again here for my slightly different readership. All excellent comments Jack, and with the AE admin crew, we discussed these very issues before we decided to go ahead and publish the contest information anyways. There can some times be benefits to working for free for artists starting out. There I said it. I don't like it but its true. My first professional gig for an online client was high-profile and a poor student and I did the work for free and it led to more work. I still don't make enough to pay all my bills though even though I now generally charge Guild prices. That's reality: scientists do not usually have a lot of funds, and even funds earmarked for promotion of the research seldom go into artwork - something I hope high-profile sites like Art Evolved and Symbiartic will help. Muddy Colors has excellent comments on this here and here. You may also wish to consult the Should I Work For Free infographic. No I'm not kidding, it's smarter than its sarcasm looks. This is not to say that it is right to do free work in this instance for Mr. Persons. And here is where I should emphasize that though I'm on the ART Evolved admin team, these are my own opinions and I likely don't speak for everyone. I don't want to lose people in research like Scott Persons as an ally. Science-artists of all kinds -scientific illustrators, animators, fine artists, cartoonists, graphic designers, infographic artists, amateurs- need scientists to be engaged with our work. We also have a duty to educate people who may hire us on best practices. Often when approached by a client, I give them a full break-down of my process, and typical fees and whether I am deviating up or down from anything typical. I keep them in the loop throughout the process with sketches and so on. When Craig first let the other admins (Peter, Mo and myself) know about Scott's request, I was bluntly, unhappy with it. The last thing in the world I want ART Evolved to become is a clearinghouse for free art for the science community. I want our talented members to get paid. But I didn't want to alienate a request like Scott's, though it was naive (understandably so if he has not worked with illustrators before - this is not a slight against Scott). Ultimately, each artist affiliated with or who reads this site can make up their own mind on whether they should do this type of work for free. I hope each of them thinks it through, and decides whether its right for them.And I hope through comments like yours Jack, Scott and other researchers learn useful information for future projects. What do artists think? What do researchers using art think? 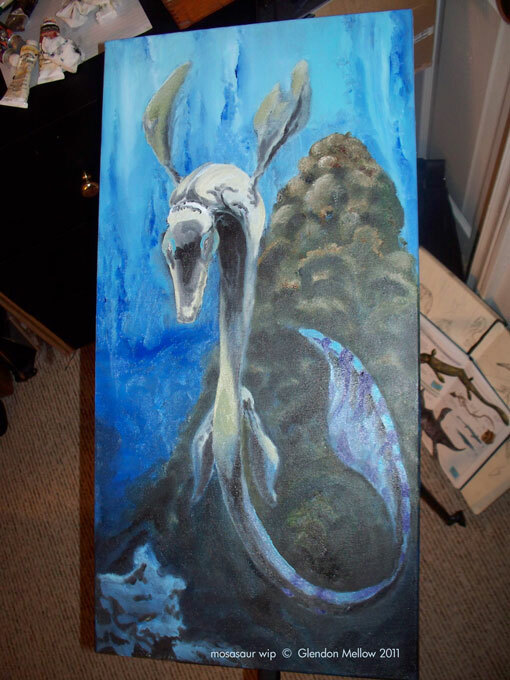 Written by Glendon Mellow On August 6, 2011 In "Art Evolved", "Going Pro", "art 4 sale", "contest", "dinosaur", "science art"
When I was approached by Craig Dylke's fiancee Lady R to create a painting for his birthday, I was pretty excited. Craig is one of my fellow Art Evolved admins, and really the brains behind the whole operation. He's a prolific blogger: he also creates educational stories with Traumador the Tyrannosaur, shares his work in progress on Weapon of Mass Imagination, and his other projects on Prehistoric Insanity. I didn't know that one of Craig's favourite groups of prehistoric creatures are the mosasaurs: large prehistoric marine reptiles often mistaken as dinosaurs. Lady R filled me in on this, and I love painting undersea landscapes. 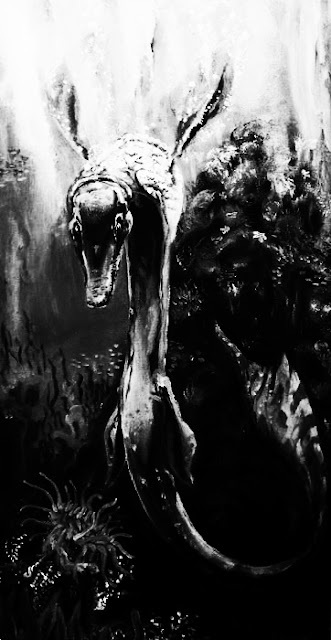 Check out this cool short fiction story by Mike Everhart with an illustration by the inimitable Carl Buell for more mosasaur goodness. So to get started, I looked at reconstructions of these ancient beasts, flipped through books of fossils and visited some specimens at the ROM. Dmitri Bogdanov's reconstructions on Wikipedia were helpful and evocative. I didn't do any direct skeletal sketches. Instead, I thought about their form and considered doing either Taniwhasaurus or Tylosaurus; Craig and his fiancee met while both were working in New Zealand, so Taniwhasaurus seemed a good fit. In the initial sketch above, I tried to convey a bit of time passing: a visual storytelling tool I admire but seldom employ. It's the idea of a moment before or after action takes place. One of the best examples of this in art is Michaelangelo's David, a man who is at the cusp of his decision to act against the terror of Goliath, knowing his life will be forever changed after. Many people don't realize that David is actually quite angry in his face, and his body is held back at a moment of relaxation before action. 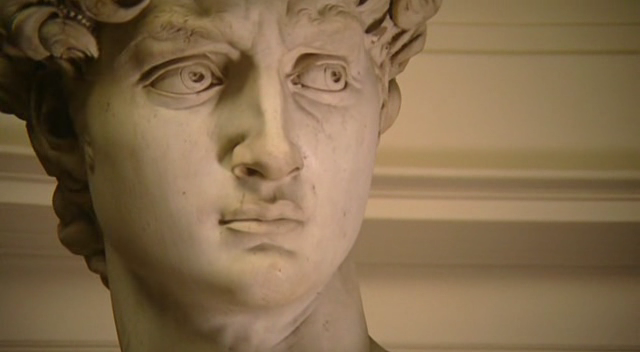 The face of David by Michaelangelo, 1504, marble. Image from Wikipedia, uploaded by Roropapa. 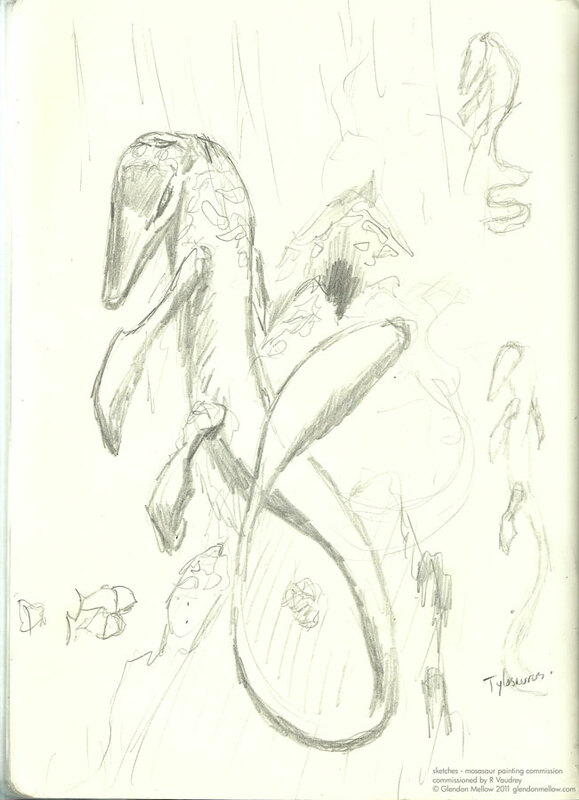 With the above sketch, I tried to convey a lazily floating mosasaur turning its head to regard the viewer: what happens next? I included a reef covered mound behind the animal. I knew from the get-go I wanted to include a fossil or anachronistic trilobite on some stone in the background. By making it a mound, it served as a way of changing the lights and darks from the surrounding water and giving a gentle inverted "V" pointing the eye toward the center of the composition. Not quite content, I started just sketching loose shapes, and thinking about Chinese dragons, especially the ones illustrated by western artist Wayne Anderson in The Enchanted World: Dragons book. Long sinewy shapes, snakelike bodies and unrealistic energetic curves. I can't stress how much that shape appealed to me. The bulkier Taniwhasaurus gave way to the sleeker Tylosaur. Once the sort of doubled-over shape appeared on the page with its parallel shadows and highlights, I thought I might have something. It reminded me of a hummingbird, even moreso after I drew a second set of fore-flippers, which made it look like it had wings beating really fast. I shared my initial sketches not only with Lady R, but also with artists I know and admire, Carl Buell, Chris Zenga and Eric Orchard. Clearly, this hummingbird pose was the winner. Fuelled by coffee, I took a 12"x24" canvas I had primed with a black acrylic base and sketched the basics in white chalk pastel. It took a few tries to get the head and lower flippers where I wanted them. Then, I laid down some simple colour in oil, above. You can see the 1st of three attempts at the light in the water, above. With a pose this unusual, I decided to play it safe with the rest of the composition. An easy landscape composition is one that has three levels of distance: a small entry point along the bottom for the viewer, like a hummock of grass in a landscape. The middle distance is typically where the action or focus is. The further distance (in my case, to the left) is blue-shifted even in open-air paintings and often shows distant hills or mountains. Desolation, 1836, Oil on canvas, by Thomas Cole. Image from Wikipedia, uploaded by MarmadukePercy. 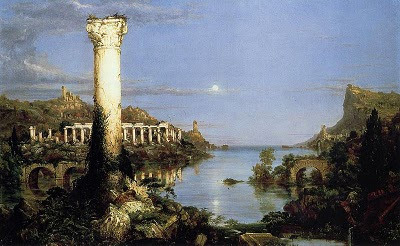 The viewer stands near the lone column, the desolated ruins and bay are in the middle distance inviting us to explore, while the rocky outcrop on the right and distant shore complete the sense of space. I cranked up some Die Antwoord, Chemical Brothers and Gorillaz and got started on the painting. Coffee and fast music with big beats always help me keep pace with the brushstrokes. I mainly used the brushes above, especialyl my BFF, the one bent like a dental tool. I have two of those, and one I use for highlights, the other for detailed dark lines and cracks. That's the colour palette about halfway through. Above you can see the second attempt at the light in the water. Part of the way through, I got worried it was too much. Too skinny and snakelike. Too exaggerated. So I decided to email paleo-author Brian Switek of the blog Laelaps and book Written In Stone and bounce a couple of images off his brain to see what he thought. Brian pointed out that the base of the tail was too thin, and the spine of the tail likely ran under the fleshy fin, not over as I have above. I happened to check Art Evolved that day and - LOL! Craig had posted a Phylopic doing exactly the correct shapes Brian was suggesting to me! It was hilarious timing. I wondered if Craig somehow knew what I was up to. Below, the third and final attempt at the light in the water. 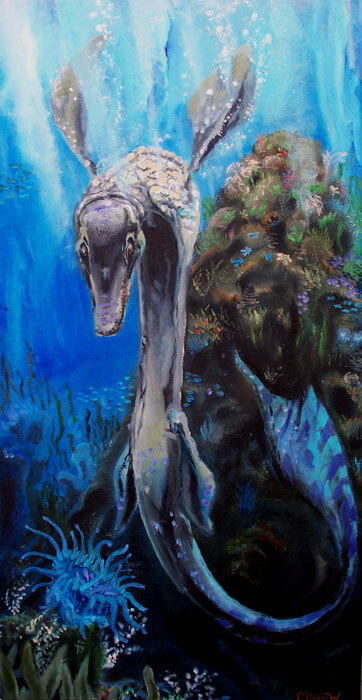 © Glendon Mellow 2011 Tylosaurus Reef - the final version. Fixed the tail, above. Thanks Brian and Craig! I don't typically worry about perfect scientifically-sound accuracy on a reconstructed painting like this. I'm more concerned with issues of drama and well, weirdness, not to put too fine a point on it. This is an exotic creature that is invariably shown leaping out of the water to bite fish or pterodactyls. I wanted to convey quiet menace and a possible posture (or is it impossible?) that gave us another way to look at the animal. 3/4 of the painting is dark, with only patches of light to draw the eye down. Is the painting successful in guiding the eye? Am I relying on the colour information too much? 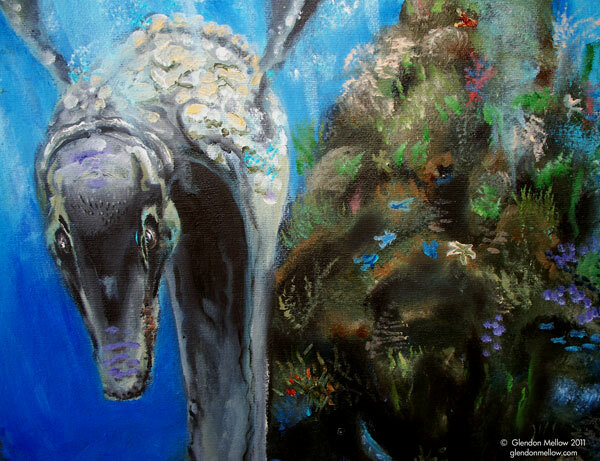 © Glendon Mellow 2011 Tylosaurus Reef - detail. In the end, the image has a few hidden surprises in it: the trilobite: a maori symbol significant to Lady R and Craig; and not visible in these photos, a simple snorkeling Traumador on the side of the thick panel. And if anyone else tries to copy the hummingbird pose for a mosasaur I'm coming after them. This commission was a joy to do, and ended up being one of my most colourful paintings. Thanks to Carl Buell, Chris Zenga, Eric Orchard, Brian Switek and my wife Michelle for feedback during the process. Thanks Lady R! Happy Birthday Craig! Written by Glendon Mellow On March 20, 2011 In "Art Evolved", "art history", "ocean", "oil paint", "paleo", "process", "sketch", "wip"
My copyright. Mine. Go 'way. 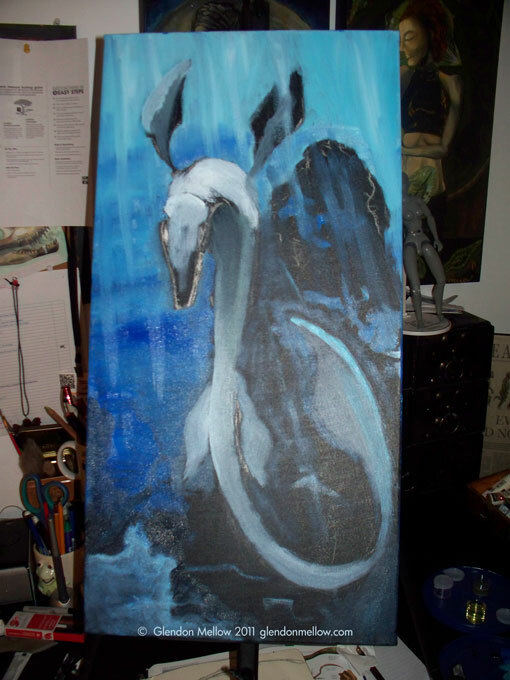 I assert a copyright from this day forth on painting mosasaurs in the pose of a hummingbird. © Glendon Mellow 2011 not just on the artwork itself, but the pose and that shade of blue 3 mm from the right next to the funny-looking bubble. Go read this at Art Evolved. Important copyright assertions and analysis. Written by Glendon Mellow On March 13, 2011 In "Art Evolved", "Creative Commons", "copyright", "humour", "ocean", "paleo"
The Terror Bird gallery is up at Art Evolved! © Glendon Mellow 2011 Click to make it big enough to eat your face. ArtRage, with a final bit of texture added in Photoshop. Head over to check out the gallery. Some really nice drawings (etchings?) by Bill Unzen as well as an unsettling Sesame Street homage by Peter Bond, detail by Craig Dylke, fun by Trish Arnold and more. The next gallery is on hadrosaurs, May 1st. Anyone can submit their new or old artwork. Written by Glendon Mellow On March 4, 2011 In "Art Evolved", "ArtRage", "digital", "sketch"
For David Maas's Ask A Biologist speedpaint challenge on Art Evolved, I chose the question, Do octopus limbs grow back? Though the answer is no, I gave my octopus a few split digits, as though a new tip grew next to a partially severed one. Painted in ArtRage in 30 minutes. Still learning to speedpaint digitally: I didn't expect the "glitter" setting to make that much texture under the other layers of paint. Written by Glendon Mellow On January 28, 2011 In "Art Evolved", "ArtRage", "cephalopod", "speedpaint"
This story concerns online art theft, copyright infringement, a plucky band of bloggers, and dinosaurs. ART Evolved, the online paleo-art blog and network of approximately 20 paleontology-inspired artists and illustrators who blog. deviantArt (known as dA), the massive online art sharing site. When I say massive, as of August 2010, dA has over 14.5 million members and over 100 million pieces of art uploaded into it (Wikipedia). For those in the science community unfamiliar with it, it acts like Facebook and Flickr, but heavier on the painting and drawing than photography with lots of manga and comics and inspired amateurs. Dr. Manabu Sakamoto, aka Mambo-Bob, an artist contributor to Art Evolved and paleontologist at the University of Bristol. He blogs at The Raptor's Nest. *theSpinosaurusGuy, aka Brenden, a dA user. Early yesterday morning, Manabu emailed the rest of the list of Art Evolved members about something all artists fear: someone else was posting his artwork online and taking credit for it. This person, known by the dA pseudonym of theSpinosaurusGuy (real name listed as "Brenden") had posted about 12 of Manabu's dinosaur drawings on deviantArt and was taking credit for them, watermarking them with his pseudonym and posting dA-enabled widgets in his gallery saying they were not to be copied. Another artist on dA who is also familiar with Manabu's work had alerted him. You can see Manabu's artwork here in his online gallery. Click on Allosaurus-top view for example. You can see in the screen-captured images below, theSpinosaurusGuy clearly claiming this as his own. Note the same Allosaurus top view drawing on the left. Click to enlarge. Note the watermark on the right-hand image, claiming that as his own as well. Note the watermark and the "artist's" comment. It's theft. Pure and simple. It's not a re-use, or a fan homage to Manabu's art. It's not a gallery where theSpinosaurusGuy collected his favourite pieces of art (dA does have that feature, and everything is clearly labeled as the original artists' work.) He is not claiming to be Dr. Manabu Sakamoto, he is instead claiming the artwork as his own labour. Manabu doesn't have a deviantArt account. A number of other dA members do however, and with a minimum of discussion, we acted as individuals, but part of a group helping our respected peer. I started by making a brief comment on the Albertaceratops, the feathered raptor, the top-view Allosaurus and a few others. DeviantArt is very aware that this type of behaviour can and does occur, and has a mechanism to deal with it. Next to every posted artwork, there is a "Report a Violation" link, which allows you to write a brief description of the complaint, and provide a link to evidence it's a violation. I filled about 6 of these out. I also left comments beneath each one with links back to Manabu's gallery so others could see for themselves: deviantArt is a very social site, you can add friends, comment and click "favourite" on art have nested conversations. I left the comments so new visitors would see that theSpinosaurusGuy wasn't the artist he claimed to be. Letting Manabu and our Art Evolved peeps know what I'd done, I came back a couple of hours later to find that theSpinosaurusGuy had blocked me from making further comments and labeled me a spammer. Of course, the comments I'd made were all deleted. But it didn't matter. You see, Peter Bond, of Bond's Blog and one of the driving forces behind the current Pink Dinosaur charity drive is also a dA user, and started to comment on the rest of the ones I had missed. And what Bond did was brilliant: he replied in the nested comments to previous commenters who had unwittingly praised the thief. Now, all of the people praising the work knew Spino-Brenden was a fraud. While that was done, I had received automated messages from the dA moderators that they had removed the 6 pieces of art I had complained about: within about 4 hours! Not bad for a site with approximately 1.5 million comments daily! Discussion in the Art Evolved emails was heating up. More members of Art Evolved, like Ville Sinkonnen, Raven Amos, Trish Arnold and Nima Sassani jumped in and continued to post messages. Ville and Trish posted journal entries on dA about it, Peter re-posted Ville's, and I posted a critique of one of the works. Journals and critiques can't be deleted by the offender. And we were civil: let's be clear here, I think all of us recognized that theSpinosaurusGuy is likely somewhat young and naive about art, copyright and social media. This was not a pile-on with the intent rip him a new one. Most of us called for the artist to stop deleting comments, feel ashamed, and give Manabu an apology. More artwork was removed by the dA moderators (go moderators!) Some of theSpinosaurusGuy's former dA friends started to chastise him on his message wall. As I write this, only one of Manabu's drawings, a ceratosaurus, is still on the site. Another dA user, not affiliated with Art Evolved has found that a computer-generated Barney the Dinosaur parody actually belongs to another artist Spino-Brenden has stolen from. Once the jig was up, dude, if you're reading this, you should have apologized and taken them down immediately. Comments like the ones in the screen-capture below just enraged everyone. Click to read the jackass-ishness. As I said before, I suspect you are younger than many of us in Art Evolved, and probably in your teens. DeviantArt is a great place where you can find a niche for almost anything and have positive contact with people, and maybe that's what you were looking for. And I get that. One of the ways to appear as a respectable, sensible adult is to take responsibility for your mistakes. It's still not too late. You'll continue to take some heat from some people on dA no doubt, but suffer through it, and become what you admire. There's a reason I asked Manabu and our Art Evolved peeps if I could write about this experience. You see, the online world has changed things. Now, there's a niche for artwork of every kind, and lots of people with similar interests can find each other quickly. And while dinosaurs are granted a certain fondness and awesomeness in popular culture, there's a relatively small niche of artists passionate enough about them to be really into it. Theft is going to get found out. All of us on Art Evolved experienced a point in time where we made a decision to go online with our artwork. It's a tough decision, and everyone frets to varying degrees about what will happen if our work is stolen. We slap copyright symbols on it, and some of us put obscuring watermarks on the images. We employ Creative Commons Licences, or rail against Google ImageSearch for making it so easy. We vary on how much we protect our artwork, and how much we like to share it. None of us is likely to know if an indie punk band in Vienna has downloaded our Diabloceratops for their gig posters. So if you're an aspiring artist looking to get into paleo-art or any kind of image, and you're nervous about making a big enough name for yourself online, here's some stuff you can do. If it's a fan homage, say it is. Don't re-post someone's stuff without asking. If they have a blanket statement saying it's okay, make sure you link back to them and give them credit. Always give artists, illustrators and image-makers credit. Always. Just ask. Always ask if it's cool. Most illustrators love feedback. Use the © symbol a lot. State what you want. Blog. Post comments elsewhere. Reciprocate. Become friends and peers to others with similar interests. If you can, be part of a network or group online. "I got yer back" is one of the most heart-warming statements you can utter to a friend. Be civil and intelligent when you dialogue. Ask for help from your support network. I encourage anyone to put their artwork online. And becoming part of a network makes everyone stronger than without it. All of the Art Evolved crew for giving one of our own your support and for carrying yourselves maturely. To the deviantArt moderators for reacting quickly. To other dA artists for shaming the behaviour and not shrugging their shoulders. And to Manabu for agreeing I should write about this. All opinions above are my own. 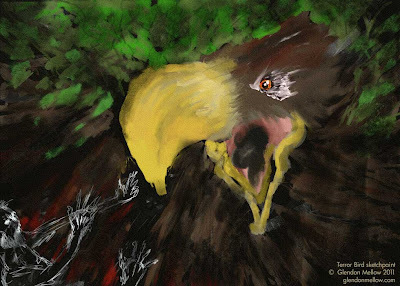 Artwork in those screen captures is by the talented Manabu Sakamoto © 2010 of The Raptor's Nest. Written by Glendon Mellow On October 26, 2010 In "Art Evolved", "Image-CitationCitation", "deviantArt", "dinosaur", "links", "science art"